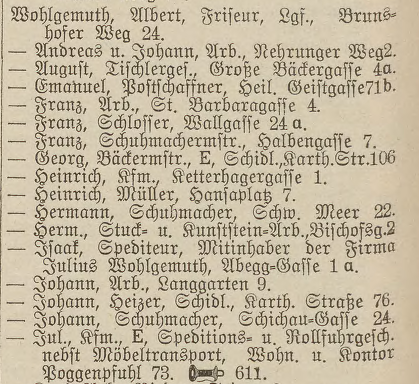 A couple of years ago, I found the names of two clothing businesses owned by our grandfather Hermann Ringel listed in a database of Jewish businesses expropriated by the Nazis. One was his own outerwear manufacturing company, Hermann Ringel & Co. The other, an export-import menswear wholesaler, was co-owned with a partner. The database gave us something we hadn’t known—the name of the wholesale business. The company was Reichenthal & Ringel, with addresses in the heart of the Scheunenviertal, first on the Spandauer Bridge and then at Schönhauser Allee 8. We never knew much about this partner, except for his own treacherous act of stealing the money Hermann had set aside to get his family out of Germany. Walter recorded our mother Helga’s account of the thievery in his Ruby Family Histories. But we never had a name for the partner who took Hermann’s money after he died in 1938, and nearly scuttled the desperate escape of Hermann’s widow and daughter. The database told us his name was Reichenthal, but I had not tried to identify him precisely. Today, in compiling a list of Berlin addresses associated with Hermann Ringel, I looked for the first time for a telephone directory listing for Reichenthal & Ringel. I found several listings, dating back to 1921. In each case the business listing was associated with a residential listing for Isser Reichenthal. So now we have the full name of the man who helped to establish Hermann in business, but who betrayed him in the end when it was a matter of life and death. I’ll be looking further into the life and postwar fate of Isser Reichenthal during my upcoming trip to Berlin. 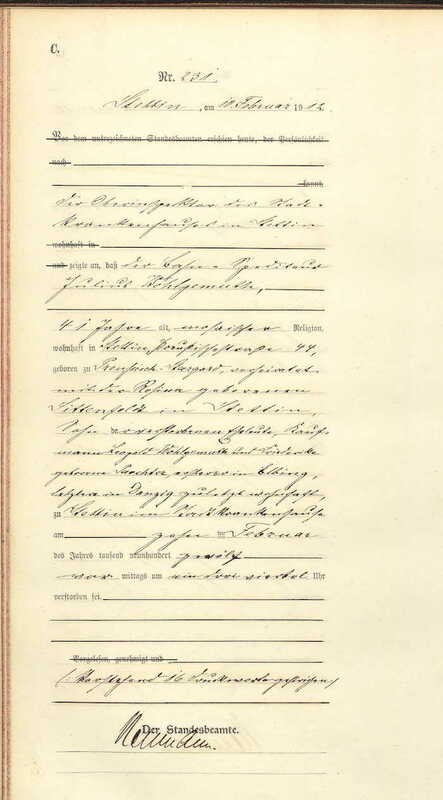 The Nazis kept a card file of German Jews called Reichsvereinigung der Judes in Deutschland. 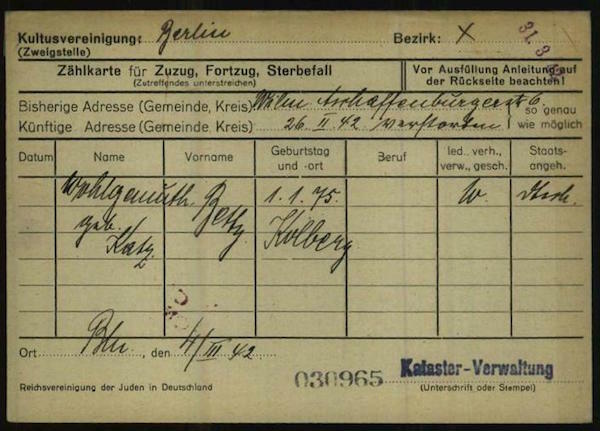 Here is the index card record of the death of Betty Wohlgemuth in February 1942. It includes her given, maiden and married names, and dates of birth and death. I don't believe there is any notation of the cause of death. In any case, there will be one less Jew to deport to Theresienstadt. I will give a full translation later. Having updated Ancestry with the name of Julius Wohlgemuth's son, I next ran a search on Leopold Meyer Wohlgemuth. The first hit was definitive. 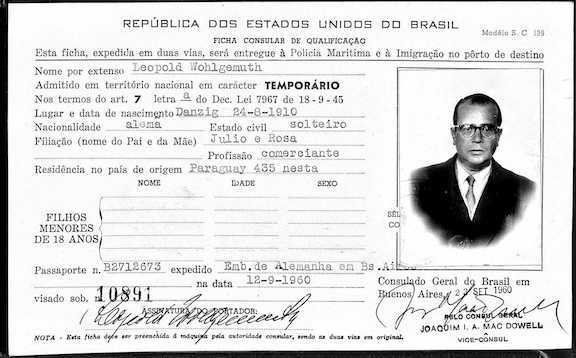 He received a immigration permit from the United States of Brazil in September of 1960. The permit was issued at Brazil's consulate in Beunos Aires, suggesting that Wohlgemuth had been living in Argentina before that. His nationality is listed as German; perhaps he has already reclaimed German citizenship under the post-War administration. I wonder what kind of life he made for himself in Brazil. I will dig deeper to see what else I can learn. Meanwhile, it is thrilling to look at the picture of Elly's first cousin as he begins life in 1960 as a Brazilian immigrant. Access books, articles and organizations referenced in the It's Legendary! article. Patti S. Borda, "Myth buster’ uncovers family's real Civil War story," Frederick News Post, April 2013. Rabbi Meir Wunder, "The Reliability of Genealogical Research in Modern Rabbinic Literature,” republished at Rav-SIG Online Journal from an original publication in Avotaynu: The International Review of Jewish Genealogy, Winter 1995. With so many opportunities for error, either accidental or deliberate, every family legend gets distorted in a unique fashion. You have to dig into the facts to learn where on the scale from substantially true to flat-out fictitious your legend lies. Most likely it is somewhere in between. Three cases in the genealogy literature bear this out. This sidebar is part of an article originally published in Family Tree Magazine's special issue "Discover Your Roots" in Summer 2014. ¶ In 2013 during the lead up to the 150th Gettysburg anniversary, Marcia Hahn of Frederick, Md. submitted her family heirloom—a Confederate cavalry officer's sword that had belonged to her ancestor—for display in an exhibit. Based on the sword, the family legend was that the ancestor was a horseman and Southern officer. The experts pointed her to military pension records that showed that the ancestor was actually an enlisted infantryman on the Union side. He had probably scavenged the sword as a battlefield memento. “My quest to discover the story of my Civil War ancestor proved to be a fascinating journey. Along the way I unwittingly refuted almost every element of the story as it had been told for generations,” Hahn told a reporter. ¶ Conversely, when Australian genealogist Lindsay Swadling set out to document an elderly relative's story about an ancestor's role in the colonial history of New South Wales, she found that the basic points of a legend passed down by word of mouth for 160 years were mostly accurate, except for modifications to conceal convict ancestry, common in Australian genealogy. Her investigation did not contradict the legend but flushed out details that yielded a richer understanding of what had happened and why. "Our culture, unlike many others, places very little trust in oral history.…We are told that family legends are unreliable, as they can in fact be. The lesson I have learned is that such stories should not be discarded without investigation—there may be more than a grain of truth in them,” Swadling concludes in her journal publication. ¶ Most often, an investigation will reveal at least some basis in truth but with many key points distorted, as in genealogist Connie Lenzen’s detailed study of an Idaho settler family. Contrary to three separate accounts published in a 1992 “heritage book” covering a county in Missouri, the George W. Jackson that came to Idaho from Missouri in 1862 did not strike it rich as a gold miner. She found that after several failed mining ventures he left Idaho in 1870 but returned years later to support his family as a butcher and small-time rancher. Several other points referenced in the heritage book—a divorce, a snowbound accident—turned out to be inaccurate when fact-checked against other sources.